Muscat is based on robust, modern and open-source technology that is widely used around the world. Muscat itself is also fully open-source and all the code is available on GitHub. Muscat integrates a full and responsive discovery interface built on the open-source project Blacklight. Search options range from simple single-field search to advanced boolean filtering. The data model in Muscat is tailored to the inventory of music sources. It follows state-of-the art library data modelling practice and is designed to fulfill the needs of the contributing institutions. Support for incipit display and searching is integrated into Muscat, including the most advanced search algorithms developed by researchers in Music Information Retrieval (MIR). User access can be freely defined, from guest users with no write access to full admin users. Users can send comments and feedback to the community directly from Muscat. It is possible to upload images directly into Muscat. There is also support for displaying inline images served by libraries via IIIF thanks to the Diva.js high-resolution image viewer. Muscat keeps track of all changes made to the source inventory. A so-called diff tool makes it possible to see precisely who changed what and to revert the changes if necessary. Authority data sets are linked to external and larger authority resources, such as VIAF. Muscat also offers a SRU interface and an option to export manuscript descriptions to MEI. Muscat provides geo-spatial visualization of the search results. It is integrated directly in the discovery interface, making it possible to dynamically visualize subsets of the data. Muscat 5.0 is up and running! It is one of the most feature-rich releases so far. The major features of this release include the link of @mentions in comments of interactive cataloguing, links to music work authority data, filter based notification for modifications on sources, composite volumes for the description of printed items bound together, server-side validation, and faceted search on number of printed copies. We are pleased to announce the launch of the Muscat Project website! It includes information pages about the features and the current developments. 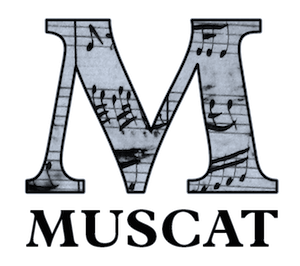 Muscat is a project of the Répertoire International des Sources Musicales (RISM) and is currently maintained and developed by the Swiss RISM Office and the RISM Central Office. The Muscat installation of the RISM Central Office is hosted by the Staatsbibliothek zu Berlin - Preußischer Kulturbesitz.